First of all I'd like to thank you guys for visiting and your kind comments, even though I've been forced to put blogging on the back burner for a while. You rock! Last week I mentioned I would be stocking some stretchy knit fabrics in my fabric shoppe. I have received a few bolts already and somehow I managed to squeeze a little personal sewing into my currently super busy schedule! For my easy Sunday outfit I chose a cute vintage kitty print in grey and lilac :) I made a comfy oversized batwing tunic and a pair of soft leggings. Both pieces are simple to sew and I finished them in one afternoon. Letzte Woche hatte ich erwähnt, dass ich mein Stoffsortiment um Jersey/Interlock/Sweatstoffe erweitere...nun, einige sind bereits eingetroffen. Irgendwie habe ich es trotz momentan sehr viel Arbeit geschafft ein Casual Outfit für mich zu nähen! Und zwar aus einem süßen Jerseystoff vom Swafing mit Vintage Kätzchen in Grau und Flieder :) Das Top hat Fledermausärmel und ist, so wie die Leggings sehr einfach und schnell zu nähen. Beide Teile waren an einem Nachmittag fertig. Apropos Stoff - die Dawanda Rabattaktion läuft noch bis zum 6.04. Mitternacht! Before cutting and sewing I pre-washed the fabric. I don't recommend putting these type of fabrics in the dryer, as they will distort. Rather I layed them out flat on my drying rack. Once dry, I iron them from both sides. When sewing knit fabrics a ballpoint needle is required. Alternatively, in my case, I used my serger, but a small zig zag stitch works fine too. I used this on the neck and hemline as well as the sleeves. 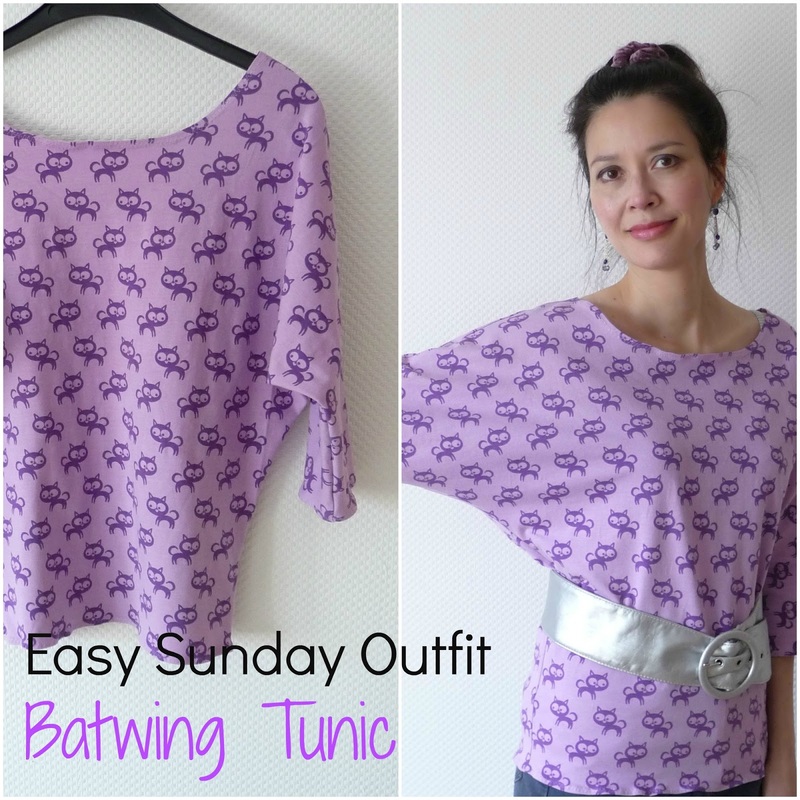 The batwing tunic pattern is adapted from the book Sew what you love. 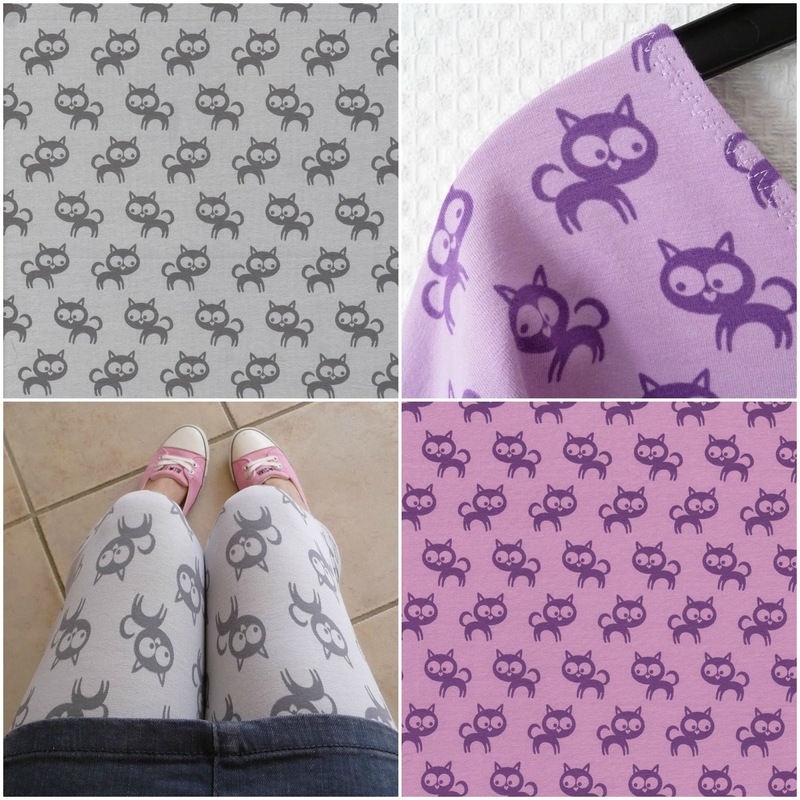 I had to tweak the pattern a bit to fit my size :) I drafted the grey kitty leggings myself following the tutorial by Miranda. She explains it all so well - I think I might be making myself a few more, now that I have my very own custom pattern! Vor dem Anscheiden/Nähen habe ich die Stoffe im Schonwaschgang gewaschen und nicht in den Trockner gesteckt, sondern auf dem Trockenständer flach liegend trocknen lassen. Danach von beiden Seiten bügeln. Macht's gut, habt einen schönen Tag! It's so cute and looks comfy Duni! Great work! Deine neue Jerseykleidung ist toll! Ich finde, dass Dir das Fledermaus-Shirt wunderbar steht. Dieses Flieder ist eine tolle Farbe!! Und Leggins selber nähen, dass muss ich meiner Tochter sagen. Denn sie bekommt zur Konfirmation eine Overlook - dann fehlen ja nur noch die passenden Stoffe, stimmt´s Duni? Ich wünsch Dir einen wunderschönen und glücklichen Sonnentag! What cute fabrics! And the outfit looks so comfy! This is my perfectly favorite color! Whimsical cat pattern brings extra fun! Lovely and comfy! This is the cutest print! I love the shape of the tunic. It looks so comfy. Those are so fun! It took me a minute to notice the heart-shaped nose, haha. I always like to see what you make, keep them coming! Die Leggins gefallen mir supergut! Oh don't you look ever so lovely! die Leggings solltest Du glatt in Dein Sortiment aufnehmen, sowas von süß ohne peinlich zu sein. Wahrscheinlich hast du aufgrund der Rabattaktion sowieso schon total Land unter, aber ich kann es mir nicht verkneifen, kurz mal nach den Sweatstoffen bei Dir zu schauen. Oh Duni these are adorable! I especially love your leggings (and your pink slip on converse...I had been looking at those but wasnt sure...now I'm definitely going to get them!). I love the kitty prints! So cute. You are gorgeous Duni. Your Sunday outfit is delightful. The fabric is too cute! What a talent you have! How wonderful to be able to envision an outfit and just make it! The finished product is adorable. Your vintage cats are adorable. What CUTE fabric! Love your purple vintage kitty top! What a cute outfit! The print is really fun. Love the top especially - it does look comfy! Duni, I love the fabric and the color. Everything looks so comfy, yet still cool and stylish :) It pairs well with your equally comfy Converse. You also look so pretty in the photos. You look so fresh and young. Love, love, love the kitties! What an adorable outfit!